Full Time With Benefit status – Employees who are regularly scheduled 72-80 hours per pay period. Part time With Benefit status – Employees who are regularly scheduled to work 60-71 hours per pay period. These employees are not eligible for benefits but will receive a differential added to their base hourly salary. Full Time w/out Benefits – Employees who are regularly scheduled 72-80 hours per pay period. Part Time w/out Benefits – Employees who are regularly scheduled 60-71 hours per pay period. Part Time employees – Employees who work only as needed rather than on a regularly scheduled basis and less than 60 hours per pay period. Per Diem Employees – Employees required to work at least one weekend shift per twenty-eight (28) day schedule and one major holiday per six (6) month period. There is a $200 deductible (maximum $600 deductible family coverage), with 80% coverage after the deductible is met. When an employees and/or a dependent with OVHD medical coverage uses our facility, OVHD writes off the 20% of covered charges and therefore, this 20% does not accumulate toward the maximum out-of-pocket. You may elect to waive medical coverage and still be eligible for PTO, sick, STD/LTD. Proof of current coverage through another provider is required. There is no lifetime maximum. Dependent children are covered until they attain age 26. They do not need to be unmarried or live at home. They must not have access to their own employer-sponsored health care, whether or not they have chosen to enroll. Preventive care is covered at 100% in network (80% out of network) after the ($50 single, $150 family) deductible is met. Major care (crowns, bridges, dentures) is covered at 60% in network (50% out of net work) after the deductible is met. There is a limit of $1,500 per calendar year in network ($1,000 out of network) per person on the plan. You may elect to waive dental coverage and still be eligible for PTO, sick STD/LTD. The insurance covers one examination and one set of lenses every twelve months, one set of frames every twenty-four months. For a small copay, they provide medical and urgent care for certain eye related problems. If eligible, as of 1/1/2008, members who have had laser vision surgery can use their frame allowance to buy non-prescription sunglasses. There is an annual co-payment of $25. You may elect to waive vision coverage and still be eligible for PTO, sick, STD/LTD. Immediately eligible for our retirement plan contribution of 7% first year. After successfully completing the first year of employment, this will increase to 15.9%. Vesting increases as your years of service increase with 100% vesting after 6 years. Employees working 30+ hrs a week are provided at no cost with a life insurance and accidental death and dismemberment policy equal to five times their annual salary, maximum of $500,000. 30 days after the date the disability occurs, the employee is eligible to apply for STD. Employees can receive 60% of weekly pay up to a maximum of $1,845 per week, minus other income paid to you because of your disability. 180 days of disability, employee is eligible to apply for payments of up to 60% of monthly pre-disability earnings, up to a maximum of $8,000. This benefit is not paid by OVHD. When traveling for business or pleasure, in a foreign country or just 100 miles or more away from home, you and your family can count on getting help in the event of a medical emergency. 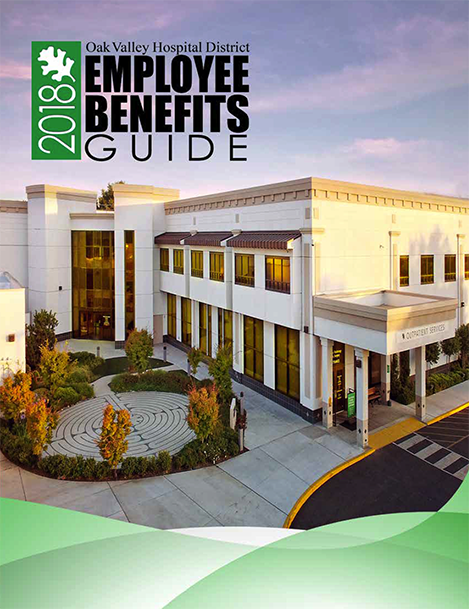 Oak Valley Hospital District offers employees a self-funded 403(b) Plan, a tax-sheltered annuity, which allows for pre-tax payroll deductions to help prepare for retirement. Labor Day, First Monday in Sept.
Thanksgiving Day, Fourth Thurs. in Nov.
OVHD provides benefited employees with accrual of four days (32 hours) for full-time employees (prorated for part-time employees) per year. Employees who have completed their 90-day provisional period are eligible to apply for personal, medical and educational leave of absence. Employees who have completed one year, and worked 1250 hours during the past year, are eligible to apply for Family and Medical Leave for the birth or adoption of a child, the serious illness of a child or spouse, or their own serious illness. Employees are eligible to have pre-tax deductions made for un-reimbursed medical expenses (up to $5000 per plan year) and childcare expenses (up to $5000 per plan year). Please contact the Human Resources Department for further details. All employees of Oak Valley Hospital District and their immediate family are eligible to use our Employee Assistance Program. Employees who are experiencing personal problems may meet with a social worker on the phone, face to face, or over the internet up to 5 times per issue. All meetings will be confidential, and the employee may select the meeting site. All meetings will be confidential. Oak Valley Hospital District offers a competitive benefit package to all benefited employees. You may refer to your Health Plan Document and Summary Plan Description for more detailed information. Employees that are not benefited are eligible for the pension plan.